So many cinematic universes are now being developed by several movie studios in the wake of the success of the Marvel Cinematic Universe, and yet all of them seem to have the same problem: they all seem to play their cards way too early, instead of having it develop organically like with Marvel. DC had that problem by cramming in way too much universe-building into Batman v Superman (which, again, thank God that Wonder Woman came by to sort it all out), and Gareth Edwards’ Godzilla tried to lay the foundations of a giant monster universe in an already-bloated standalone (so bloated, and yet they barely found room for Godzilla at all in that film!). The same now applies for The Mummy, the first in a proposed “Dark Universe” meant to unite classic movie monsters like Dracula, Frankenstein, The Invisible Man, The Wolf Man and others, which once again lays all its chips on the table before we’ve even had a chance to get accustomed to what’s at stake on the table. Also, it’s not very good. The film begins with Russell Crowe – as Dr. Henry Jekyll, who is set up as basically the Nick Fury of this universe – narrating the backstory behind this particular mummy, Egyptian Princess Ahmanet (Sofia Boutella) who gives in to dark power in order to claim the throne, but is mummified and buried in a tomb as a result. 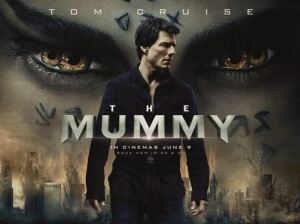 Centuries later, modern-day scavenger Nick Morton (Tom Cruise) comes across the tomb in Iraq, and upon releasing the sarcophagus from its mercury-soaked prison he also unwittingly unleashes Ahmanet back into being, putting the world in danger unless Nick and archaeologist Jenny (Annabelle Wallis) find a way to stop her evil. This movie also introduces Prodigium, a S.H.I.E.L.D-like organisation dedicated to finding and destroying evil in the world, headed by Crowe’s Dr. Jekyll who, like in his own story, also has an evil alter-ego which he must keep under control at all times. It is with this plot thread, as well as a few others, that the film slowly but surely unravels; these elements feel so forced into the story just to set up different movies that it barely feels natural or important to everything else that’s going on. It’s like if in the first Iron Man, Nick Fury showed up in the actual film instead of the very last post-credits scene and then went on for half an hour talking about the Avengers Initiative and all the other superheroes that are out there. There’s nothing about it that feels like it was originally part of this script, and comes across as a shoehorned-in introduction by the studio to properly set up this cinematic universe instead of letting it come about on its own in future instalments. Again, it’s just like with Batman v Superman where they just decided to do it all in just one film instead of several, and it feels overstuffed, pointless and completely cynical. That’s not to say that a cinematic universe with classic movie monsters can’t work, because it absolutely can – it’s been proven before with past Universal Monster films like Dracula and Frankenstein with Bela Lugosi and Boris Karloff – but when it’s unnecessarily forced in just the one film like this, then it doesn’t exactly set the best foundations. As a standalone Mummy film, however, it’s wildly mediocre and lacking that specific fun factor that made some of the previous Mummy films enjoyable. It comes across as a generic Tom Cruise movie which just happens to feature monsters in it, which is fine if what you want to see is Tom Cruise doing his usual schtick – and to be fair, Cruise is having as much fun with this as he can – but it’s not particularly interesting when the film constantly teases other parts of this universe and backstory, and features characters that either spout long paragraphs of exposition or are just there to provide some tonally-confused comic relief, like Jake Johnson who appears throughout intense scenes of mass destruction just to spout lines like “well, that was intense!”. You don’t really get to know any of these characters, and thus you don’t really care about whether they save the day or not, except for Tom Cruise but only because it’s Tom Cruise, which makes this a pretty empty experience on an emotional level. Even the Mummy herself, Sofia Boutella, is severely under-developed, despite the addition of a sand-set prologue which lays on the exposition more than your typical fictional novel, and never comes across as intimidating or even that scary. There are a few positive factors to it, for instance it has some intriguing ideas – even the Prodigium aspect with someone like Dr. Jekyll heading it – which, if developed as their own entities, could have really been interesting to explore, and when it allows itself to be fun it certainly achieves that, especially with a certified action star like Cruise involved. But there’s no denying that The Mummy is a complete mess, setting the shakiest foundations for a cinematic universe since Batman v Superman, and not exactly working well as its own standalone film either. However, there is hope that a Wonder Woman equivalent will come by to get this cinematic universe back on its feet, which given that the next proposed film in this series is Bill Condon’s Bride of Frankenstein just might happen after all. The Mummy is a messy and cynical attempt to kick-start yet another cinematic universe in the wake of Marvel’s success, and as an introduction to this world of monsters it’s clunky and forcibly shoehorned-in, while as its own standalone film has more faults than successes, even with Tom Cruise doing his usual reliable action-movie stuff in a film that isn’t good enough to deserve it.